There are a large number of different opinions about the safeness of our drinking water. What is not doubt about is that human body needs only Hydrogen and Oxygen as a natural solvent in the body chemistry. Due to the industrial revolution and the development of society itself, our water has being contaminated. In an effort to clean our water supply, we add inorganic minerals like chlorine and alum to our drinking water.
" The inorganic chemicals like chlorine, alum and sodium fluoride can not be healthfully utilized by the living tissues of the body. Our body chemistry is composed of 19 organic minerals, which must come from that which is leaving or has lived. When we eat an apple or any other fruit or vegetable, that substance is living." These inorganic minerals usually found in our tap water can cause clog and hardening of the arteries, calcified toe and finger nails, bad posture from inorganic deposits between the bones, even have an effect in your ear or eyes. 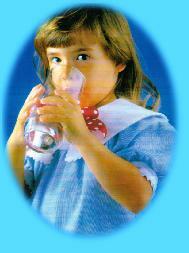 Safe drinking water is pure hydrogen and oxygen that is exactly what our body needs. Do not drink water that contain inorganic minerals (heavy metals) like Chlorine, alum, mercury, lead, arsenic, zinc, sodium fluoride and others. Be a winner. Drink Pure Water. Browse our drinking water filters and start enjoying a great tasting water. Impress your neighbor using it for tee or coffee. Make great tasting juice for your kids. A homemade beverage will never be the same! Reverse Osmosis Water Filter Systems: The reverse osmosis system removes up to 99.9% of undesirable water contaminants by forcing untreated water through a semi-permeable membrane. Pressure forces the water to flow in the reverse direction to the direction of flow in natural osmosis. It is considered the best filtration system in the market today. Water Coolers: These modern and well design water cooler systems offer great tasting water and the convenience of storing it at a preset temperature. We carry bottled water coolers, bottleless water coolers, filtered water coolers and water coolers with reverse osmosis filtration. Counter Top Water Filters Systems : These convenient, easy to install water filters eliminate impurity of the tap water and offer a fresh, great tasting water. Our inventory includes counter top system developed by NRG enterprise which have 1 micron absolute filtration, cyst removal and cyst reduction following NSF standard 53. Under Sink Water Filter Systems: These water filter systems are very conveniently installed under the sink and they effectively eliminate the impurities of the Tap water to offers a great tasting water. Ultraviolet Drinking Water Filters Systems: The Ultraviolet Drinking Water Filter Systems effectively eliminates microorganism that may cause waterborne diseases and produces safe great tasting water. Water Distillers: These systems use the distillation process to remove impurity of the tap water and offer a Pure Drinking Water.